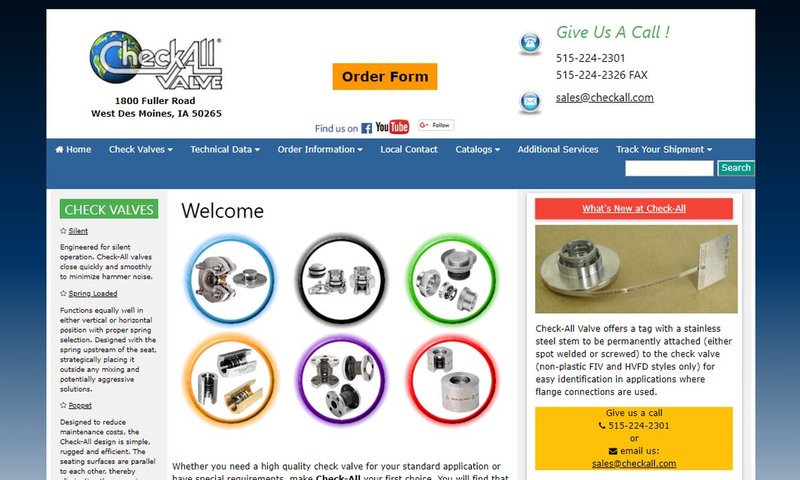 A reliable source for Check Valves information and a resource for accessing leading Check Valves and suppliers. Check valves are self-activating relief valves. They operate entirely by reacting to the flow and pressure generated by the process streams in which they are installed. Also known as one-way directional or non-return valves, these devices are designed to allow fluid, air or gases to flow in only one direction and eliminate backflow. Virtually every plumbing or fluid transfer application imaginable, be it industrial, commercial or domestic, employs check valves. They are an essential, albeit unseen, part of everyday life. Sewage, water treatment, medical, chemical processing, power generation, pharmaceutical, chromatography, agriculture, hydropower, petrochemical and food and beverage processing industries utilize check valves in the everyday operations of their facilities for effective backflow prevention. Because they prevent product malfunction and need not be supervised while functioning, check valves are not only desirable but often required by law to ensure the safety of water, gas and pressure applications. Check Valves Check valves are self-activating relief valves. They operate entirely by reacting to the flow and pressure generated by the process streams in which they are installed. Frank P. Cotter invented the first check valve in 1907. His valve was easy to install, inspect and repair. In 1916, Nikola Tesla invented another check valve, one that he called a Tesla valve. This valve, which he patented in 1920, was a simple one-way fluid valve. Once plastic and manufacturing technology advanced enough, manufacturers began making plastic diaphragm check valves, which are common in the medical industry. Over the years, manufacturers have had to adapt to different regulations. For example, in January 2014, Congress passed the Drinking Water Act, which states that any object to come in contact with drinking water can have, at most, a 0.25% lead content. This has lead (no pun intended) to manufacturers spending a lot of time replacing old, lead-based water supply piping systems with ones featuring components, including check valves, made of plastic or stainless steel. While the general design and function of the check valve is relatively simple, manufacturers take a number of important considerations into account when sketching their product diagram. They do so to ensure that materials flow through the valve and that backflow is adequately prevented. First, they think about the check valve construction materials, which impact the effectiveness of the device. If manufacturers use incompatible materials, the valve will wear, erode or contaminate the process stream. Manufacturers choose from a wide range of plastics, metals and synthetics. Common materials include PVC, brass, ductile iron (for iron body), copper, polyethylene, polypropylene, aluminum, carbon steel, stainless steel (for stainless steel body and stainless steel spring) and rubber. Material choice is so important that, sometimes, the valve is named after it (e.g. iron body check valve). Second, manufacturers consider check valve size. Check valves come in a range of sizes. The most important consideration regarding the size is the diameter of the seat and stopping device, which may be less than an inch or several feet across. Properly sized check valves are easily installed in pre-existing flow lines, using the dimensions of the pipe or tubing to determine the necessary size. The valve size will also affect the pressure rating or cracking pressure of the valve. This is the minimum pressure at which the valve will operate, or open. If the valve is too large or bulky, the pressure created by the process stream will not be able to open it, even when the opposing pressure is exceeded. Undersized apparatus will allow a continuous flow and never close. Such malfunctions could result in damaged equipment, wasted materials and potentially hazardous cross-contamination. Further factors to consider include media temperature, differential pressure and the valve flow coefficient. 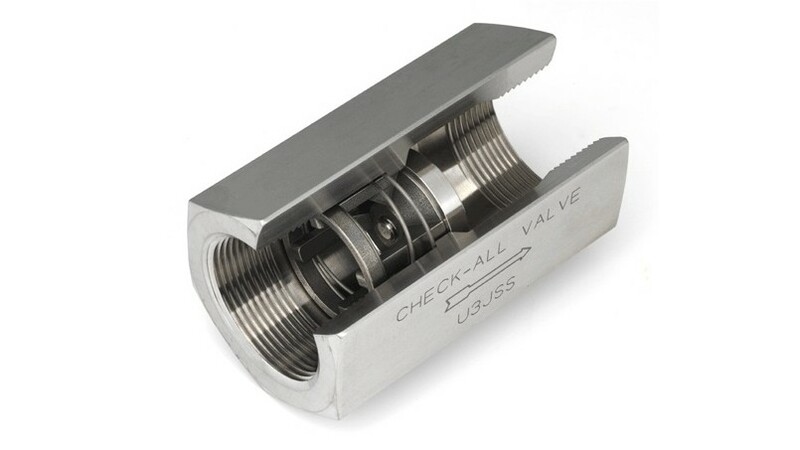 All considerations, including specific check valve type, depend on the valve application. To cater to unique applications, manufacturers frequently create custom check valves. Check valves are becoming increasingly popular because of their simple design and ease of use. The mechanics are fairly simple. As aforementioned, check valve operations are determined completely by the process flow, meaning no additional actuating mechanisms are necessary. In general, the valve appears as a cylindrical device attached to the pump head on the inlet and outlet lines. Open in both ends, the working apparatus cross-cuts the housing, dividing it into an upstream and downstream portion. The seat extends from the walls of the cylinder but has an opening suitable to passing the process stream. A ball, cone, disc or other oversized device rest against the seat on the downstream side of the check valve. Limited mobility keeps the plugging device from being swept downstream. When the stream moves in the predetermined direction at the necessary pressure, the plug is dislodged from the seat, and fluid or gas is permitted to pass through the resulting gap. As the pressure drops, the stopper returns to the seat to prevent backflow. Gravity or a stainless steel spring loaded mechanism are commonly responsible for this return motion, though in some instances the increased pressure on the downstream side of the valve is enough to move the device back into place. The closing of the valve prevents downstream materials from mixing with upstream materials even under increased pressure. The specific stopper used is variable depending upon the type of check valve installed. As the name suggests, ball check valves use a ball. Lift check valves utilize a cone or disc attached to a rod like guide which ensures it will return to the proper place on the seat. Swing and wafer valves use one or more discs to seal the gap in the valve seat. Large check valves are non-return valves that are employed in a number of industrial, commercial and domestic applications where they are responsible for the safe and consistent downstream flow of a number of materials including water, oxygen, fuel, acids, bases, sludge, slurry and even hazardous waste. Mini check valves, or micro check valves, operate using all the same mechanisms as larger check valves, but on a much smaller scale. They’re used to precisely regulate unidirectional gas or fluid flow in small spaces. Relief valves, also known as safety relief valves, are durable devices that can handle both chemical corrosion and constant wear. Typically, they’re made from PVC, stainless steel, brass or aluminum. Their goal is to relief excess, potentially dangerous pressure from closed-top vessels or piping systems. They are normally closed before reaching set pressure. Ball check valves use a loose ball as a stopper. It may have an iron body, plastic body or stainless steel body. Used to regulate fluids, there are several varieties of the ball check valve, such as spring-loaded ball check valves, reverse flow ball check valves and three-way ball check valves. The ball stopper of a spring-loaded ball check valve comes spring loaded with a stainless steel spring that helps keep it shut. A reverse flow ball check valve operates without a spring. To return the ball to its seat, where it acts as a sealing mechanism, the valve uses reverse flow. A three-way ball valve works using either a ball valve stopper, gate valve stopper or globe valve stopper in the middle of the valve. A disc check valve is a check valve that uses a disc-shaped device as its stopper. Disc check valve types include: lift check valves, swing check valves, butterfly valves and wafer check valves. Since each of those valve types are quite different from one another, we’ll talk about each of them under their own definition heading. Lift check valves are disc check valves that feature a disc, also known as a “lift,” that can be lifted from its seat. The lifting takes place when the inlet fluid or upstream fluid increases in psi, allowing fluid to flow to the downstream side. When the psi goes back down, high pressure from downstream or gravity will let the disk go back to its original position. Typically, lift check valves, also known as piston check valves, are used as safety relief valves and/or control valves. Swing check valves feature a flat disc that swings or pivots on a hinge pin. They do not require a stainless steel spring to work. When they swing on the seat, they stop reverse flow, and when they swing away from the seat, they permit forward flow. They are also classified as a non-return valves. Butterfly check valves are designed to regulate pressure flow in large pipes. They feature disc that is tube shaped and always stays in the stream. The disc regulates flow as it rotates. They are either iron body or stainless steel. Butterfly check valves are used in a wide variety of industries, including: food and beverage, chemical and pharmaceutical. Wafer check valves are one-way valves that prevent backflow by allowing fluids to flow in only one direction. The psi of forwarding fluid flow opens the disc check valve, and the pressure from back flow closes it. This swing check valve comes with a stainless steel body or an iron body. Spring check valves use a stainless steel spring to increase pressure required to open the valve and help maintain closure. When the pressure differential across the valve is high, spring check valves are used to prevent valve clapping and overflow due to heightened downstream flow. They also protect against strong upstream surges such as water hammers. Double check valves use multiple valves in conjunction with one another. Usually, they have a stainless steel, plastic or iron body. They may be employed to reduce wear and further protect against backflow that may otherwise result in pressure surges, cross-contamination and even flooding. A pilot valve is a small but non-modular valve that works with a high-pressure flow or high flow feed. Arranged in a flanged mounting style or connected through metallic pipe, it blocks reverse flow while permitting free flow through the check valve into an actuator. The pilot-operated check valve is known for its exceptional sealing capabilities. It is best for clamping applications and holding applications. However, it is not good for controlling the flow of overrunning loads; nor is it good for use with cylinders. Solenoid valves are compact, energy efficient valves controlled by an electric current that passes through a solenoid. They feature ports and fluid paths. While there are different designs, most solenoid valves have two ports (2-way valves). When the valve is “open,” the two ports are connected and fluid can flow freely. When the valve is “closed,” the ports cannot pass fluid between each other. In the case of three-way valves, the flow switches paths between one inlet port and one of two other ports. These other ports are usually an exhaust port and a supply port. Solenoid valves are typically used to in fluidics, where they provide safe and efficient switching of flows between ports. Typical tasks include: mixing, shutting off, releasing, dosing or distributing fluids. As its name implies, a silent check valve is designed for silent operation. To that end, it opens and closes quickly, which reduces the hammer noise. To avoid shock and increase smoothness in the process system, the valve closes before fluid flow reversal. Check valves have many advantages. First, they can control psi flow rate across a wide range of industry sectors. In fact, they can work with psi pressure high enough to put out fires, and psi pressure controlled enough to work in scuba tanks. Another benefit of check valves is the fact that they prevent cross-contamination of fluids, including fresh water. Check valves can have a variety of different accessories, depending on their application. These include: controls, stainless steel housing bolts, gear operators, stainless steel springs, high visibility displays and valve status monitors. The standards to which your check valve will need to adhere depend on your application, industry and region. For example, if you are located within the United States and you’re working with petroleum, you need to look at API (American Petroleum Institute) standards. API offers a variety of specific standards based on application (pipeline valves, flanged steel pressure relief valves, seat tightness of pressure relief valves, etc.). Other important American standards institutes include: ASME (American Society of Mechanical Engineers) and ASTM International (American Society for Testing and Materials).  There are also countless international and country-specific standards out there, such as ISO, BSI (British standards), DIN (German standards) and JIS (Japanese standards). To acquire a high-quality check valve, you need to work with a reputable manufacturer that you can trust. You want to do business with a company that not only has the technical skills to carry out the task at hand, but also the service skills to do it with your best interests in mind. This is especially true if you have a custom check valve request. To help you find the right one for you, we’ve compiled a list of top-notch check valve manufacturers. We’ve placed profiles for each of them towards the middle of this page. When you’re ready to get started, take some time to peruse each of these profiles, then pick out a few to whom you’d like to speak more. Reach out to each of them with your specifications. Compare and contrast their answers, and then pick the one in whom you have the most confidence. Good luck!